OnePlus is nearly ready to reveal its newest flagship Android smartphone. 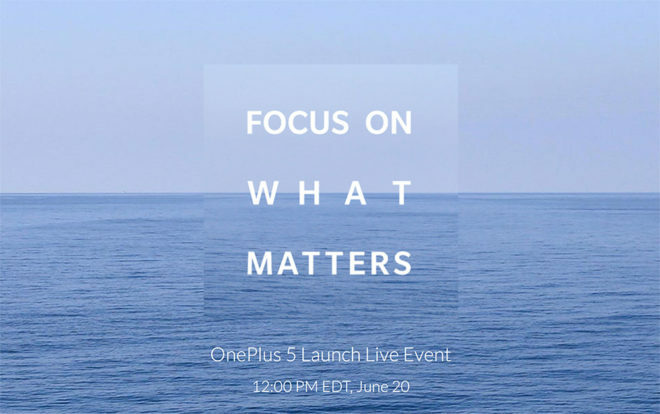 The OnePlus 5 will be announced on June 20th, OnePlus confirmed today. The device will be revealed during an online event that’ll kick off at 9:00 am PT/12:00 pm ET. OnePlus is also planning to host pop-up events in a number of cities that’ll give folks the chance to be the first to own the OnePlus 5. One pop-up event will take place at 7:00 pm ET on June 20th in New York City, meaning that if you’re nearby, you could check out the OnePlus 5 for yourself hours after its officially revealed. While most of the OnePlus 5 is still a mystery, OnePlus has revealed a little bit of info about its next hero device. The OnePlus 5 will include a Snapdragon 835 processor, and OnePlus has said that it’s collaborating with DxO to “enhance your photography experience” with the OP5. DxO is the company behind DxOMark, a popular photography benchmarking site. Anyone know if this have T-Mo wi-fi calling and bands at release? Bands…I would say for sure it will, wi-fi calling…highly doubt it. Damn, I live in an apartment complex with almost no reception and depend on wi-fi calling. The OnePlus 3T had T-Mo Wifi Calling support according to: http://www.spectrumgateway.com/compatible-phones I would suspect that the OnePlus 5 would as well. Add the t-mobile digits app and you shouldn’t have any problem. It turns any device that can connect to the internet phone capable with your number.